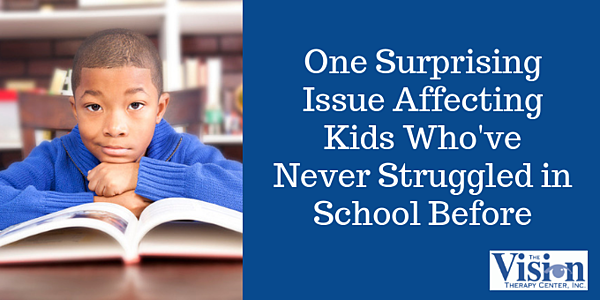 Kids can experience school problems for a variety of reasons. But beyond things like a learning disability or stress at home, one surprising issue can affect kids who’ve never struggled in school before: A functional vision problem. Every year, a phenomenon occurs after the first 30 days of school. Kids who have never had school problems, such as bad grades and behavior problems, suddenly find themselves struggling. Quite often the child is very bright, and has always done well in school. Yet after advancing to the next grade, problems seem to have materialized out of nowhere. The child could have a functional vision problem, one he or she has been able to either hide, compensate, or adapt to for years -- until now. Okay, So What is a Functional Vision Problem? Functional vision involves a set of skills that are learned and developed to help you gather and process visual information. They are necessary to perform tasks such as reading lines of text on a page, copying information presented in class and staying focused on schoolwork. Here are descriptions of the three main visual skill areas that make up functional vision -- eye teaming, eye focusing and eye movement -- including examples of problems that may result when these skills are not functioning properly. The two eyes should work as a team by aligning and pointing at the same place on the object being viewed. They should work together in a coordinated and precise way to provide single, comfortable, efficient vision and depth perception. What happens when there’s a problem: If the two eyes are misaligned, the brain won’t be able to correctly combine the image from each eye into one image. When this happens, a person will lose 3-D depth perception and may experience double vision. 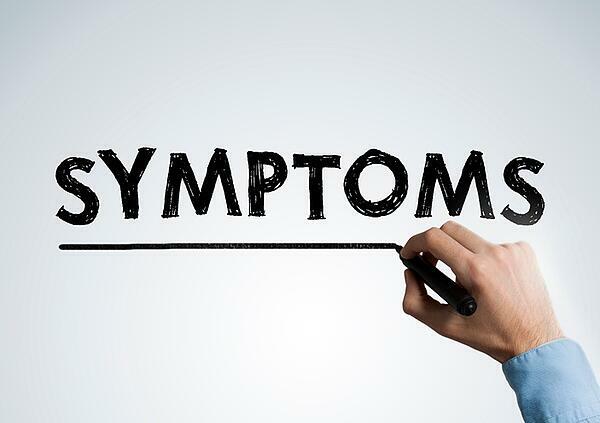 Symptoms: Loss of place when reading, poor reading comprehension, eyestrain and fatigue. Each eye has a lens that changes shape to allow the person to see objects clearly at different distances. When this skill is working well, the person can easily shift focus between objects at different distances. What happens when there’s a problem: A person may have difficulty keeping reading material in focus and may experience intermittent or constant blur, especially when looking at detailed objects held close. Additionally, the person may have difficulty shifting focus between objects (e.g. looking from the desk to the front of the classroom or vice versa). Symptoms: Headaches, eye pain, eye strain, watery eyes and fatigue. A person controls whether their eyes move, where they move and how quickly they move. This allows the person to maintain fixation on a moving object, move fixation from one object to another, or sustain fixation on a stationary object. What happens when there’s a problem: A person may have difficulty catching a ball or moving his or her eyes across a line of text, as they both require accurate and efficient eye movements. He or she may also be unable to maintain eye contact when listening. When there is an issue with one or more of those skills, you have a functional vision problem. Symptoms: Loss of place, omitting words when reading, difficulty copying text from one place to another (e.g. board to desk), reduced productivity, difficulty sustaining attention on nearpoint tasks, fatigue, poor coordination/clumsiness. Functional vision problems aren’t typically detected by vision screenings, which usually test your visual acuity, or ability to see things clearly. In fact, you can have a functional vision problem and have 20/20 eyesight. Testing for functional vision problems requires advanced equipment and training, and is best performed by a developmental optometrist who specializes in diagnosing and treating these problems. But why do These Problems Suddenly Materialize, Even Among Children who Have Never Struggled Before? Children can compensate and “live with” the vision problem -- to a point. The visual system is constantly adapting, and the brain can find ways to compensate for issues that affect your vision. For example, if you have a problem with eye teaming, your brain may suppress the image from one of your eyes to avoid double vision. While this solves the problem of double vision, it reduces depth perception and the comfort and efficiency of your vision. 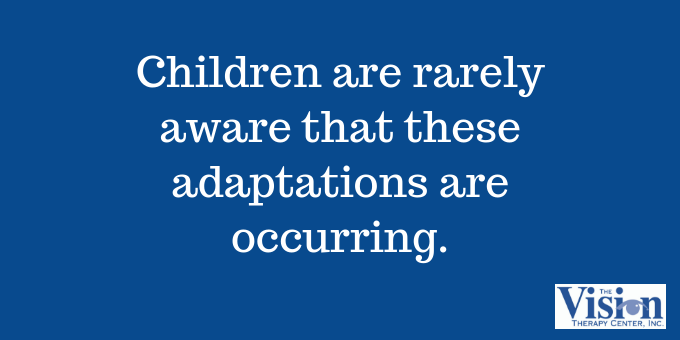 Children are rarely aware that these adaptations are occurring. Even when they are aware, they may have no idea that their visual system isn’t operating correctly because their visual experience is the only one they know. They assume everyone sees and experiences the world as they do. Why Can’t the Visual System Keep Adapting? The visual system’s compensation measures will only get a student so far. Eventually, the print will become too small to follow, or the mathematical computations too difficult to process. That’s when the struggles begin. Dr. Kellye Knueppel of The Vision Therapy Center explains how that’s possible in this video. How do Functional Vision Problems Affect School Subjects? Reading: "Many kids come in when they're five or six and struggling to learn how to read...and then we have many kids who were excellent at learning how to read, and then third grade comes, and they need to start reading longer and now they have all sorts of problems with comprehension." Math: "Math is something that many people wouldn't really think of being related to vision, but math is really about space. Numbers take up a certain amount of space. 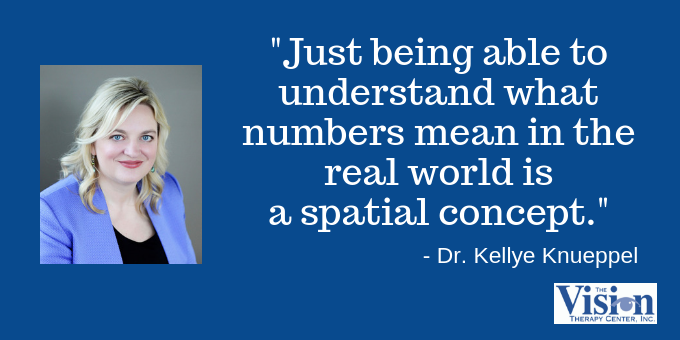 Just being able to understand what numbers mean in the real world is a spatial concept...if you have difficulty with depth perception and spatial concepts, it is much more difficult to understand what math is all about." Handwriting: "For handwriting, your vision should be the leader for your hand. If your visual system isn't working very well, you may get fatigued looking at details and it's difficult to keep looking at the page. Some people's handwriting starts out looking good, but then it gets worse the more they do it." Composition: "We see many kids who have difficulty putting their thoughts on paper. A lot of kids are good verbally, but when it comes to putting their thoughts on paper, they struggle. Many times it's the physical part of looking at the paper. Some people need some help with visualization to think about the whole story, think about it in their minds, and then write it out in a sequential manner. This is a high level of vision, but it is part of vision." Why Don’t Typical Vision Screenings Detect These Vision Problems? It’s really a matter of time, resources and expertise. Typical vision screenings are designed to test for eyesight, or visual acuity. Eyesight is your ability to see certain sizes of letters at set distances, typically 20 feet and 16 inches, on a Snellen eye chart. 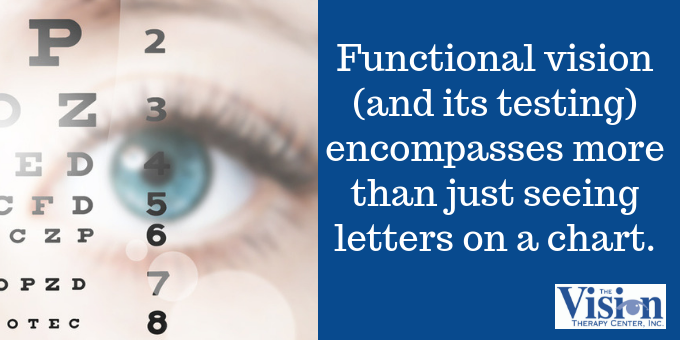 Functional vision encompasses more than just seeing letters on a chart, so testing for functional vision problems requires a more comprehensive examination performed by a developmental optometrist. This Functional Vision Test can take an hour or more, requires special equipment and training, and tests for a wide range of functional vision problems. 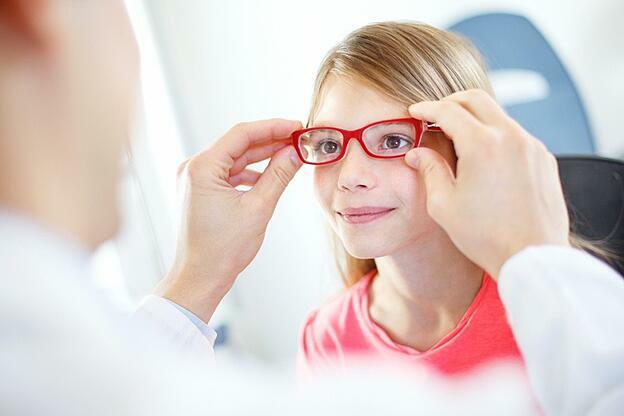 The College of Optometrists in Vision Development (COVD) notes that 1 in 4 children has a vision problem that affects their ability to read and learn. It’s why we believe every child should have an exam to rule out functional vision problem EVEN if they pass the school screening. In the long run, detecting and addressing functional vision problems as soon as possible would help us properly diagnose problems that are often mistaken for ADHD, ADD, dyslexia, and behavior issues. How are Functional Vision Problems Treated? Prescription glasses: Some patients with functional vision problems also have refractive conditions such as nearsightedness, farsightedness and astigmatism. In most cases, glasses to address these conditions only improve the person’s eyesight and not their functional vision. These are commonly referred to as ‘compensatory’ lenses. During a functional vision examination, the doctor will test to see if there is a prescription that can help a person to use their functional vision more efficiently. These are commonly referred to as ‘performance’ lenses because their purpose is to improve functional vision, not to improve eyesight. Syntonic phototherapy: Patients with functional vision problems often have difficulty paying attention to both the central and peripheral portions of their visual field. 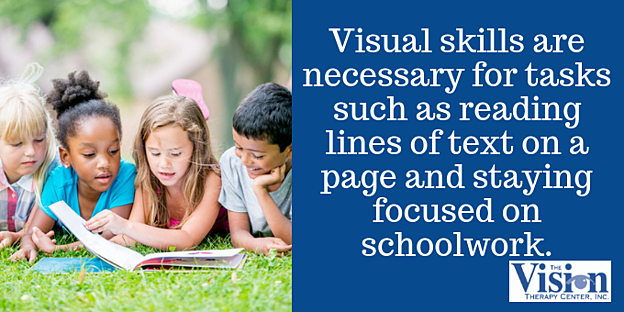 This can have a significant negative impact on their visual skills, especially eye movements. Looking at specific colors of light can actually improve the patient’s ability to pay attention to central and peripheral vision. Therefore, it is frequently used as a primer for vision therapy. Vision therapy: An individualized program combining both office and home-based vision therapy activities and exercises that address a patient’s specific functional visual problems. 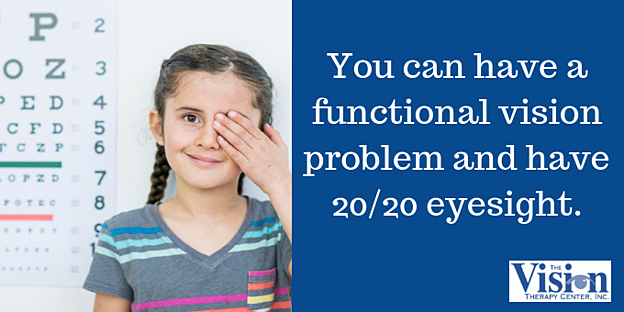 If you think your child may be experiencing a functional vision problem, the next step is to identify symptoms. Click on the link below and take the Vision Quiz to see more symptoms. The Vision Quiz score will give you an indication that further testing may be in order. It could be the first step toward getting your child back on track.